Are you wondering where to go for a European city break with your family? Why not escape for a few days to a peaceful family apartment in the center of Barcelona ? Ideally located near the Sagrada Familia neighborhood, this Sweet Inn vacation rental is the perfect place to relax after a busy day in this lively city. Let’s begin the tour here! The area around the Basilica is typical of the Eixample district with broad streets and an abundance of Catalan tapas bars and cafes. But did you know that the residential streets surrounding Antoni Gaudi’s unfinished masterpiece are also very tranquil? Such a serenity that inspired our interior designer, Naiara Pardo to design this apartment. She managed to create a very peaceful yet vibrant place in which the entire family will instantly feel at ease. In order to create a peaceful atmosphere, Naiara Pardo selected natural fabrics, such as the wooden floors across the rooms in addition to the the door frames. Furthermore, she added an ethnical vibe to the apartment with a careful choice of furniture. The El Cortes Ingles carpet, the wooden dining table from Pib or even the cactus from Fustam are some examples. In all the rooms, our interior designer played with geometrical patterns and vibrant colors to create a cozy atmosphere. She used the range of blue in the bedrooms walls, either indigo or azure to which she contrasted geometric wallpaper frames. As a result, the rooms look wider. Additionally, she chose yellow pieces of decoration like the bed table in the single bedroom or the pillows in the living room. As for the accessories, she played with geometry and opted for a white round mirror in the bedroom or bed tables with soft lines. This 3 bedroom nest can easily accommodate up to 5 people. Indeed, the spacious living-room has a large dining-table and a comfortable sofa bed. With a fully equipped kitchen, this is the perfect place for the family to reunite and relax together around a good dinner. Check out this family holiday apartment in Barcelona for your next holiday! Its location, relative serenity and lack of traffic during the night all help make it a good choice if you’re after a peaceful stay in the city. 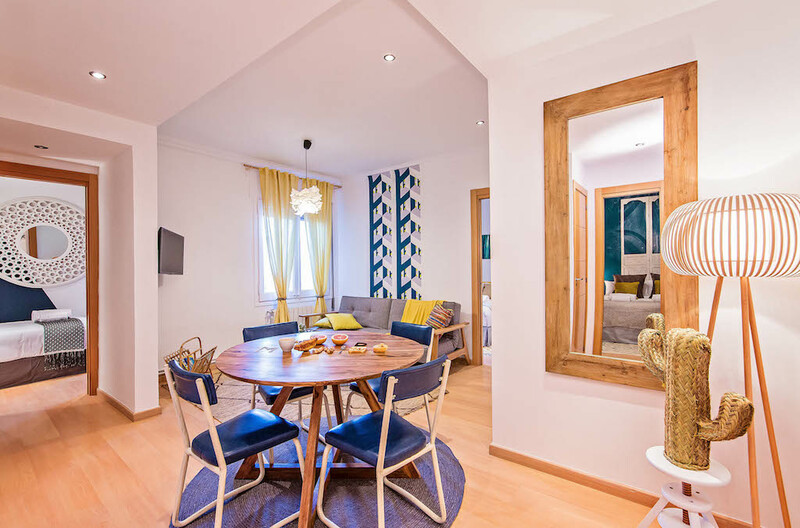 Visit our Sweet Inn website to book this Barcelona family apartment or one of our 360 vacation apartments all over the hottest European cities. Article inspired by “ 65 m2 géométriques et colorés à Barcelone !” written by Camille Voituriez and published on Côté Maison website.